We undertake house clearance in all areas of Alnwick: Acklington Acomb Akeld Allendale Allenheads Allerdean. Our client was the owner of a three-bedroomed flat in Alnwick. The flat was in a modern development, on the third floor. He had taken a job as a computer programmer in California’s Silicon Valley, and he expected to be staying in the USA for several years at least. Consequently, he had decided to get rid of almost all of his possessions and furniture, and to sell the property. We were instructed to do a complete clearance and to dispose of the contents in their entirety, with one exception. He had a large collection of books, some of which were valuable first editions, and he wanted to put them into storage with a view to shipping them out to California at a later date. The client had already removed his clothing and small personal effects. We moved furniture, beds and bedding, kitchen equipment and other general household contents. The carpets and curtains were in good condition, so they were left in place. One of the challenges was that the lift was quite small and was in any case in heavy use by other residents, making it unsuitable for us to use for the house clearance. This meant we had to use the emergency stairs, which were not spacious. This meant taking extra care with health and safety procedures to avoid any accidents, especially important when it came to the larger items like the fridge and washing machine. 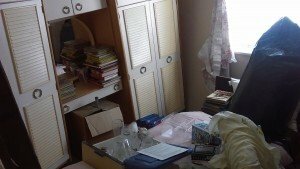 Despite taking great care with the house clearance, we worked very quickly and were able to finish the clearance earlier than expected at 4 p.m. The client’s furniture was of high quality and in good condition, as were the white goods and other kitchen equipment. We suggested that we could sell them in our own retail outlet and he could offset the proceeds against our fees. He was happy with this idea, and it meant we were able to present hymn with a much reduced final bill. His book collection was safely delivered to the secure storage facility. The client thanked us at Alnwick house clearance for our professionalism and for leaving the flat in excellent condition, which meant that he could put it on the market straight away. He was also very pleased with his reduced bill!